When you think of a Tudor home, no doubt this is exactly what you imagine. The exterior is defined by the black and white pattern typical to many houses of this period. The pitched roof and multiple small windows are also traditional features that lead us to believe this house was built during the reign of Elizabeth I. However, the house is actually mock Tudor, which refers to the revival of Tudor architectural style in the mid to late 19th century, and the The Mock Tudor period features were maintained and repaired by the contractors Field James. And that's not the only surprise: this house also used to be 3 separate flats! It just goes to show, you can't judge a book by its cover! 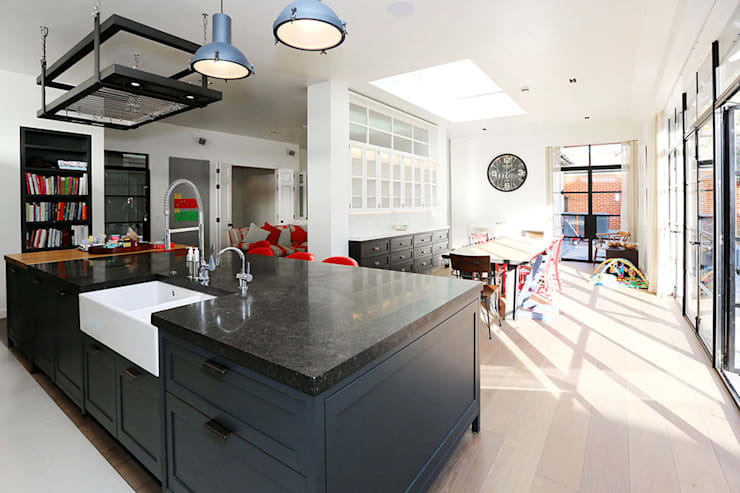 The kitchen is the very picture of tasteful design, with soft blue and grey tones running throughout, and modern fittings for providing a luxury feel. The mock Tudor windows let in plenty of natural light, and the glass panels in the dividing wall allow it to be evenly dispersed around the living areas. The pot rack above the island is a particularly quirky modern touch that instantly draws the eye, and we love the farmhouse style sink. 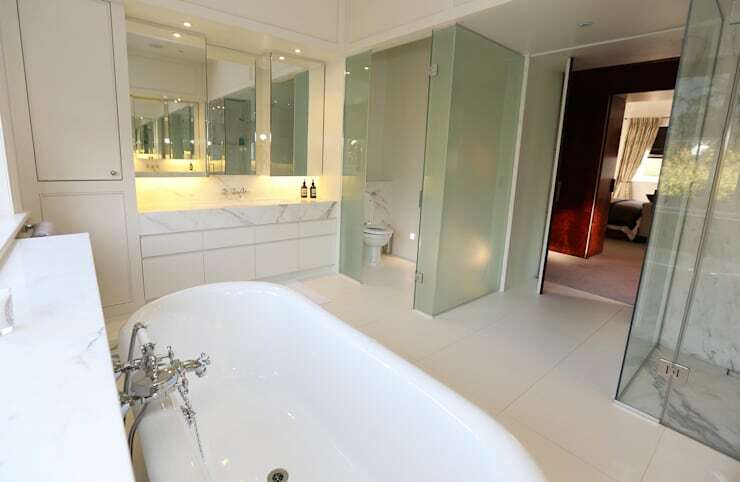 The bathroom is an elegant vision of white and marble, and it's clear straight away that the design is custom finished. A Tay cast iron roll top bath exudes luxury and exclusivity, and is the perfect place to enjoy a long relaxing soak after a hard day. The modern double shower with glass walls and a seamlessly integrated glass wall blends in to the bathroom design, making the room appear more open and spacious, and allowing us a view of the marble wall behind. From this angle, we can see how the toilet has been discreetly hidden behind a sliding glass door. Every feature in this bathroom, from the shower to the cabinets, dominate their own distinct section of the room, allowing proper attention to be paid to each individual design. The cabinets in particular look like something from a dressing room on a Hollywood movie set. The backlights and spot lights above ensure the mirrors shimmer and shine, maximising brightness and creating a stunning visual effect. In the master dressing room, a rich Mahogany wood encases the occupant's clothes and shoes, keeping them protected and out of view. 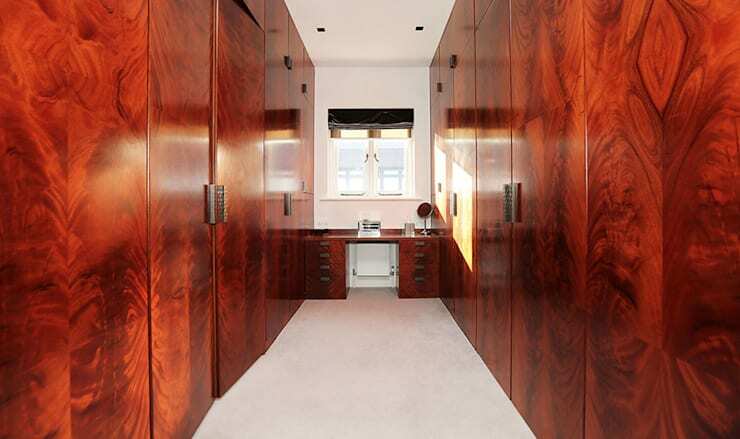 At the end of the grand corridor sits a vanity table, with a window above which lets in lots of useful natural light. The cream carpet is a classic choice that complements the style of the glossy wardrobes and contributes to the luxury feel of the room. Last but certainly not least: the garden. 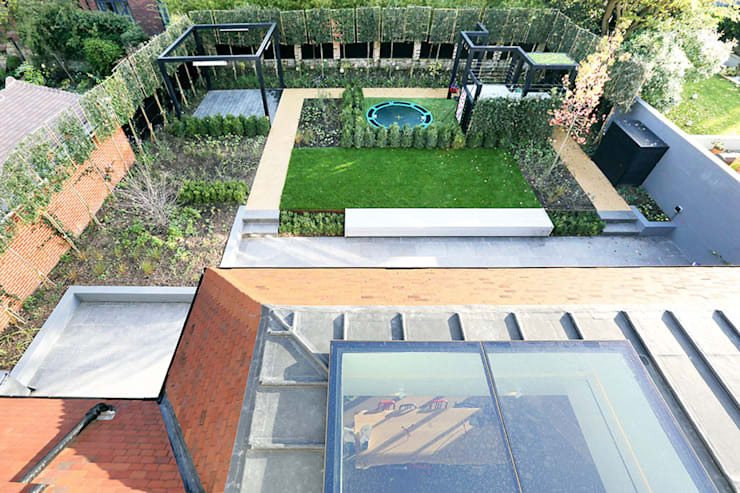 Separated into small sections for growing various plants and flowers, the garden looks perfectly arranged and well-maintained. The wall creepers surround the property with lush green tones, and the paved area directly connected to the house makes for the perfect place to sit out in the sun and enjoy a barbecue with friends! What do you think of the lavish bathroom? Let us know if you like this project in the comment section!